You are here: Home › Blog › Gov › Ubehebe all over again? Does a volcanic eruption lurk somewhere beneath Death Valley? A team of scientists at Columbia University’s Lamont-Doherty Earth Observatory say they have uncovered evidence that suggests the Ubehebe (U-bee-hee-bee) Crater last erupted only 800 years ago, not thousands of years ago as earlier thought. The website LiveScience.com reported their findings. Researchers recently said that Death Valley could be primed for a follow-up eruption. Observers are quick to note that in geologic time 800 years amounts to a blip and there is no prediction of an immediate eruption. 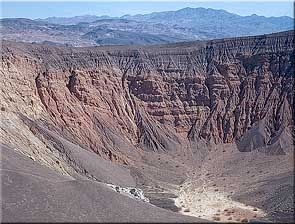 The new research on the Ubehebe Crater is documented in the current issue of the journal Geophysical Research Letters. The team of scientists gathered rock fragments near the crater and analyzed them. The results, they reported, reveal that the rocks were created by eruptions. The most recent eruption was dated around the year 1300. Scientists said that when hot magma hit the groundwater in Death Valley the reaction was probably very dramatic. Scientists do not say when another eruption might happen, but they do say they don’t think Ubehebe is done. The team was quoted as saying that there’s a good chance the crater would provide lots of warning like small earthquakes and open steam vents as much as a year in advance of an eruption.